The magic of the cup, eh? 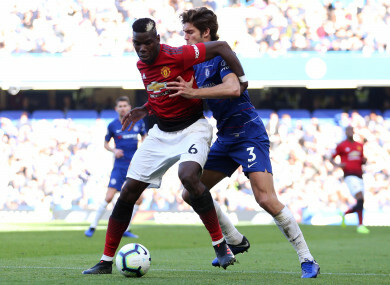 Pogba and Alonso going head-to-head in October. THE BIG ONE pencilled in for the fifth round of the FA Cup is the clash of Premier League heavyweights Chelsea and Manchester United. Ole Gunnar Solskjaer’s side face a visit to Stamford Bridge in the last 16 of the competition after wins over Reading and Arsenal. It’s a repeat of last year’s final, one which Chelsea won 1-0 after an Eden Hazard penalty in the 22nd minute. The draw was completed this evening, with the ties to be played over the weekend of 16/17 February. Elsewhere 2017/18 Premier League champions Manchester City will travel to either Middlesborough or Newport County, while Crystal Palace will visit League One outfit Doncaster Rovers. The draw in full is below. Email “Repeat of 2018 final as Chelsea to host Man United in fifth round of the FA Cup”. Feedback on “Repeat of 2018 final as Chelsea to host Man United in fifth round of the FA Cup”.